Come join the Gathering Place in welcoming Master Herbalist Darryl Patton for our first adventure into Meadowcreek. Learn how to gather and prepare wild plants from Nature. 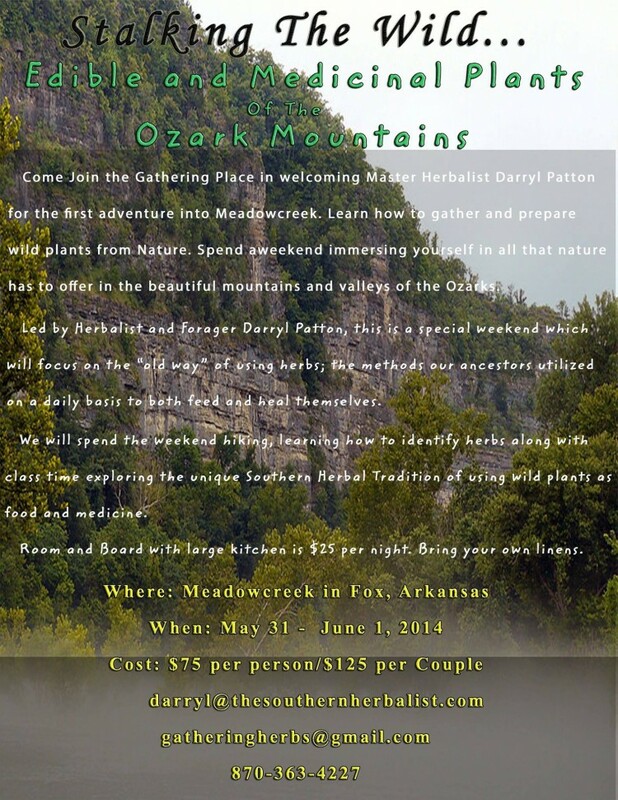 Spend a weekend immersing yourself in all that Nature has to offer in the beautiful mountains and valleys of the Ozarks. Led by Herbalist and Forager, Darryl Patton, this is a special weekend which will focus on the “old way” of using herbs; the methods our ancestors utilized on a daily basis to both feed and heal themselves. We will spend the weekend hiking, learning how to identify herbs along with class time exploring the unique Southern herbal Tradition of using wild plants as food and medicine. Room and Board with large kitchen is $25 per night. Bring your own linens.